Ryan found us this recipe in our favorite most versatile veg cookbook. We were stoked to be able to use so many items from our CSA in one dish. It was pretty delicious, but also heavy. 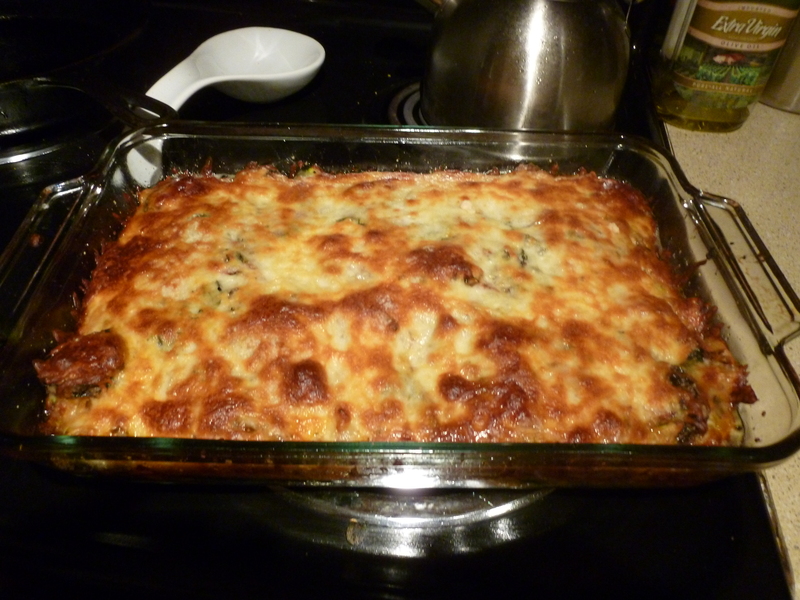 Next time we make this, we will just not fry the eggplant pieces, and reduce the amount of cheese. 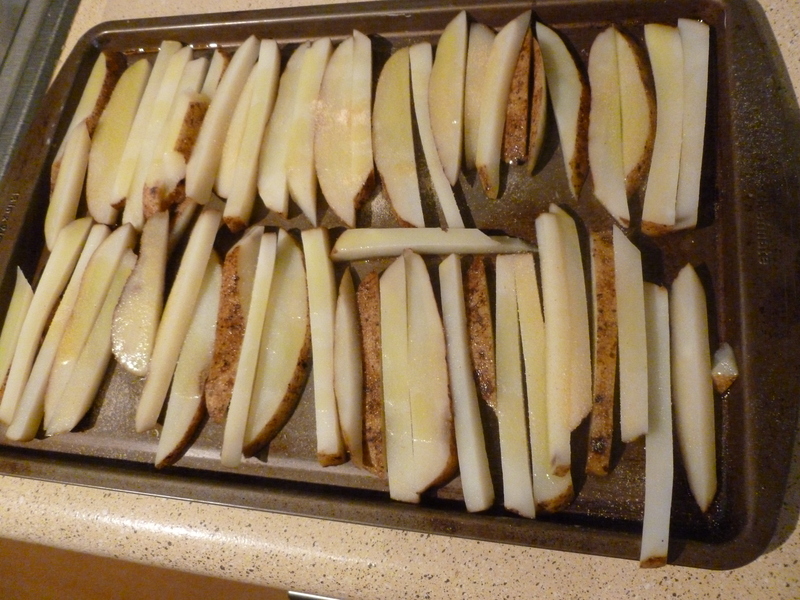 Frying each eggplant slice also took way too long, especially since we had such small pieces. Reduce heat and stir, cooking for 25-35 minutes until thick. Head sunflower oil in a different pan. Dust aubergines and courgettes with flour and fry in sunflower oil until golden brown. Set aside on paper towel. Preheat oven to 350F and butter an 8×11 oven proof dish. 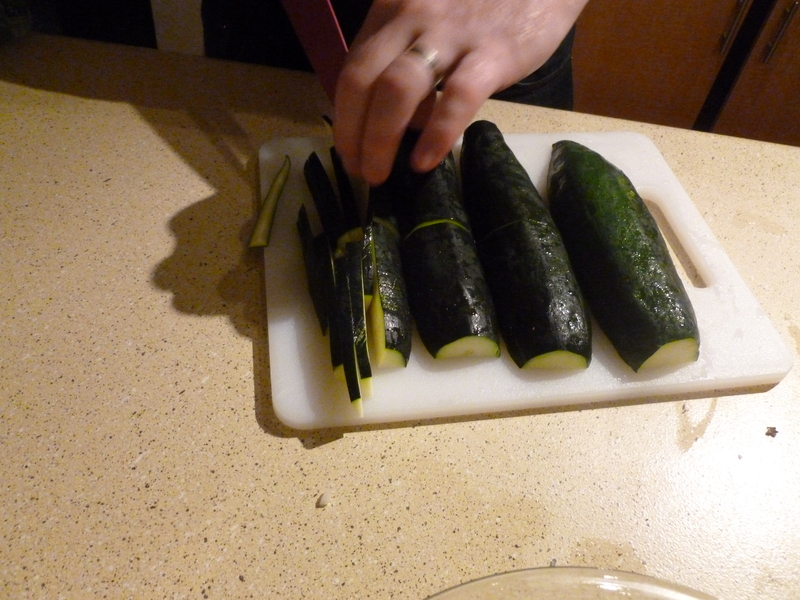 Put a layer of aubergines, and then courgettes in the dish. Pour over half the sauce and scatter with half the mozzarella. 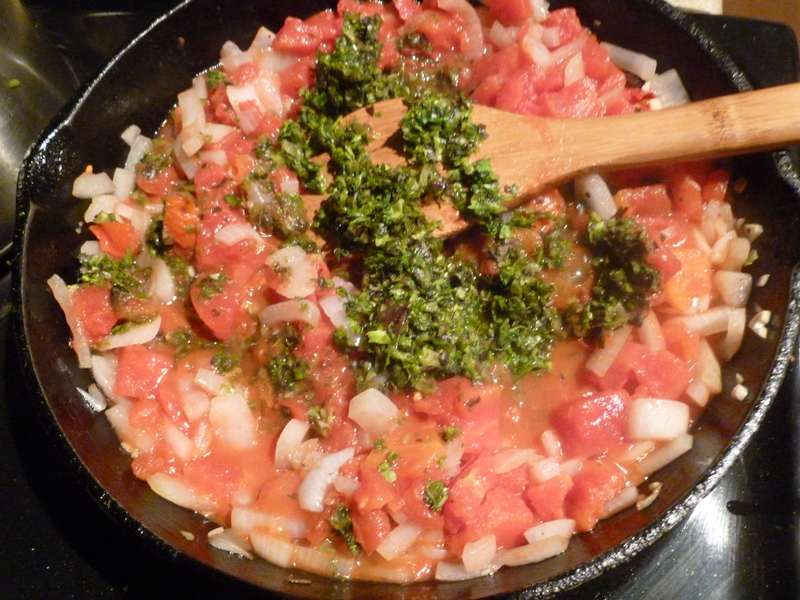 Sprinkle over most of the remaining basil and a little parsley. Repeat the layers, ending with mozzarella. Sprinkle Parmesan and bake for 30-35 minutes. 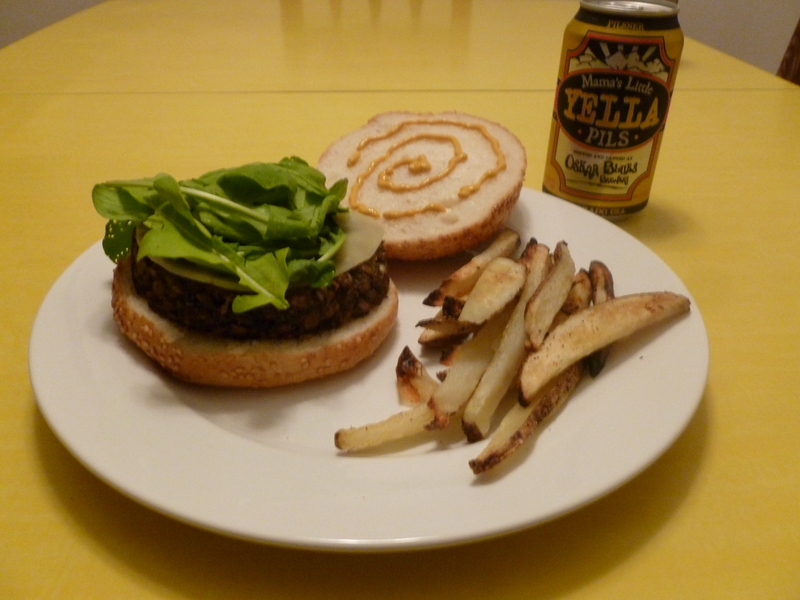 Since going vegetarian 2.5 years ago, there are surprisingly few things I miss. Every now and then I get a craving for a nice steak, but one thing that really gets me are those lettuce wrap appetizers from PF Changs. Oh man, so delicious! 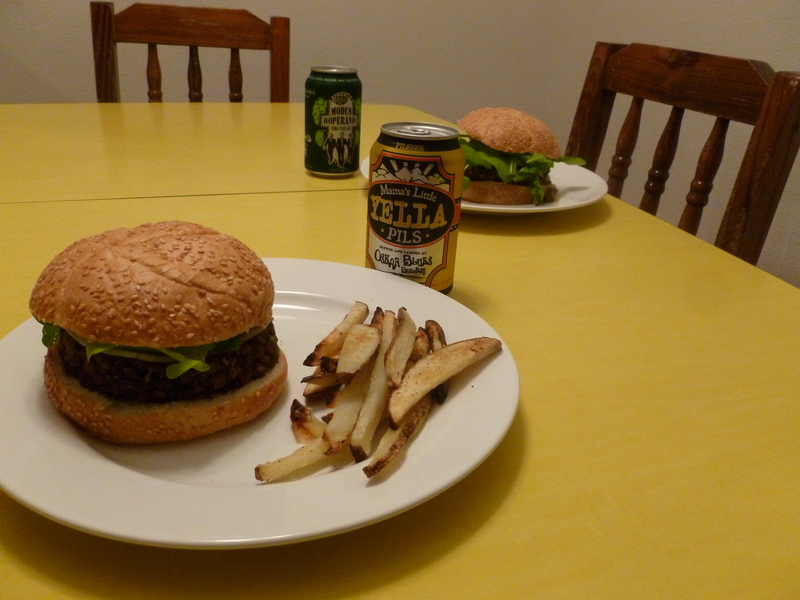 So I set out to re-create those bad-boys, veg-style. I basically just googled “PF Changs Lettuce Wraps Vegetarian” and tried the first recipe that came up. It wasn’t difficult to make, just time consuming and requiring little bits of many kinds of sauces, so that was kind of annoying. I couldn’t find those cool white crunchy noodle things that the wrap-filling is served over, so I just left them out. 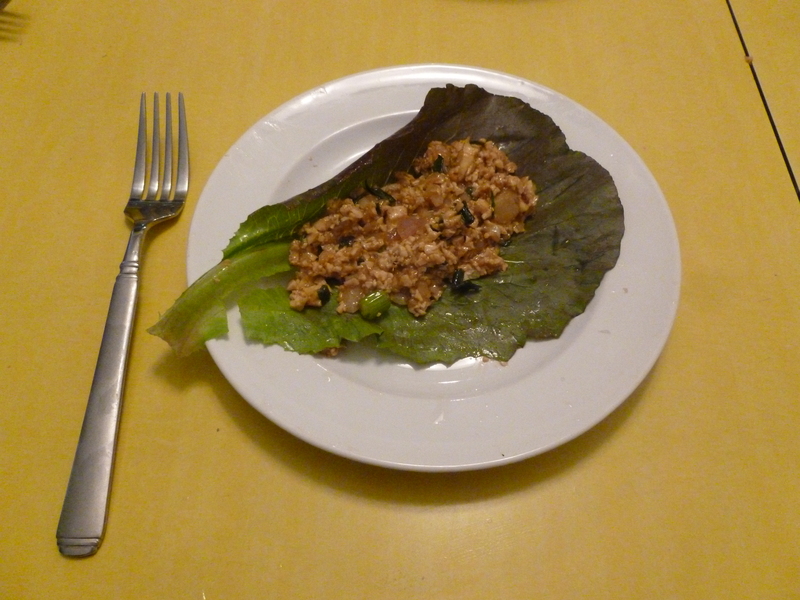 They took a really long time to make, but they were pretty close to the way I remember the PF Changs Lettuce Wraps! Unfortunately, I had been so wrapped up in making these guys (haha look at that pun), that I forgot that they are… you know… just an appetizer. So I set the platter down at the dinner table and immediately realized that I was an idiot: I hadn’t made anything else for our dinner! We ended up eating the entire platter, which was delicious. But, we left the table with stomach aches (it was pretty oily) and still hungry. Not a very good combo…. So now I’ve learned to not be dumb, and next time I will at least make up a pot of rice or something. So just for the record I have no clue what I’m doing. Sometimes I go into the kitchen and I think about how far I’ve come and wow I’m getting pretty good at this. Then there are times like this recipe, when I fail at nearly every step. But then I learn and will try to not fail again. Okay, that’s my disclaimer. When I first became a vegetarian 2 years ago, I was determined to find hearty meals where I wouldn’t ever feel as though I were “missing the meat.” After a chance dinner with a friend at Tandoori Grill in Boulder, I realized I had found my starting point with Indian cuisine. My first step was finding an easy recipe for Channa Masala online. Next I purchased “Classic Indian Cooking” by Julie Sahni, who explains many details of traditional Indian cooking to us Americans (focusing mostly on Northern cuisine), and with her amazing explanations and hand-holding I was able to create some fantastic dishes. Then my sister then bought me a cookbook “Cooking with Pedatha” for my birthday about a year and a half ago. It has been awarded ‘Best Vegetarian Cookbook in the World’ and details the Andhra cuisine of Southern India. Many of the recipes had been passed down for hundreds of years before being written down in this book! No shortcuts are taken, there is no sacrifice in the interest of saving time. It was written for Indian cooks, by Indian cooks who compiled the recipes of their “Pedatha.” This cookbook is probably worth its weight in gold. It is also really freakin scary. Because, you see, I am not an experienced Indian cook. I have never even *eaten* Andhra cuisine before so I have nothing to go off but the words in this book. Nearly all the recipes require special ingredients and take 4 hours apiece. So many weekends I would stare at the beautiful photos in the book, mark all the food I was going to make, and then chicken-out at the last minute. I seriously have had this book for a year and a half, and half probably sticky-tabbed every page at some point, but have never made a single thing. So this weekend I decided it was time. I pulled out the book and as if it were fate, there was a sticky tab on “Carrot Pachchadi”, and we had just gotten carrots that week in our CSA. I had to do it. 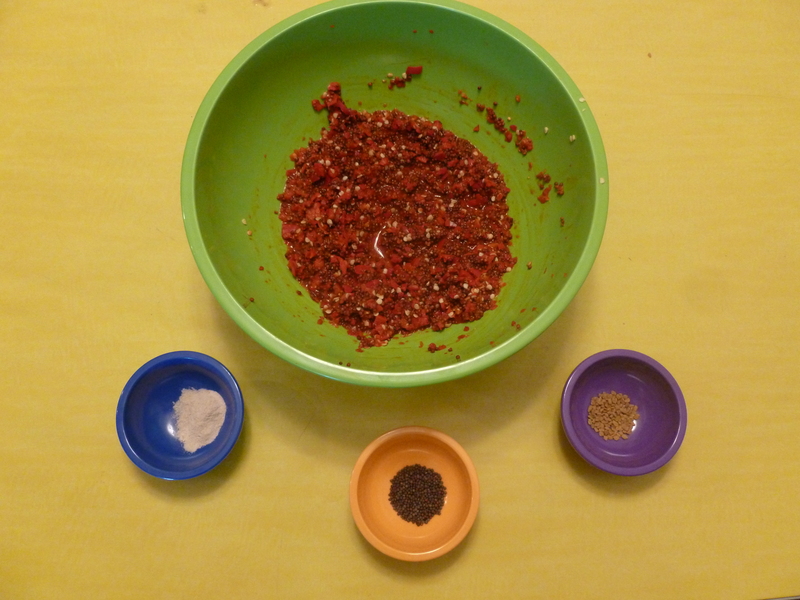 My first issue, was that the recipe calls for “Red Chilis.” In the photos in the book it looks kind of like a serrano pepper, but red (though even that was guesswork, as there was no way for me to determine scale). But really I had no idea what kind of chilis I was supposed to get. (This is probably common knowledge that I’m somehow not getting….) So I literally just went to my grocery store and walked up to the peppers and grabbed the only red peppers they were selling. They were Fresno Peppers, which I later found out are a “red compliment” of the Serrano Pepper, thanks to some panicky wikipedia-ing. That made me feel a little better about my choice. Also, she calls for “20-25 peppers, or less if you aren’t brave.” Because I still had no idea how big my peppers were supposed to be, or what size, I opted to play it “safe” with just 12. So her instructions continue to soak peppers and mustard seeds in water for 3-4 hours, or if you are short on time soak them in hot water for 1 hour. So being the lazy American I am, I opt for soaking in hot water. But wait….soak the peppers….surely she doesn’t mean just soak them whole? Should I chop off the lids, or slice up the peppers? Wait, am I supposed to seed the peppers? She doesn’t say!! I am missing so much of this common knowledge ahhhhh!!!!! Despite my sister talking to me about always seeding the hot peppers, my brain was apparently in meltdown mode and the peppers got sliced but NOT seeded. They were thrown in the hot water with the mustard seeds for 1.5 hours just to be safe. 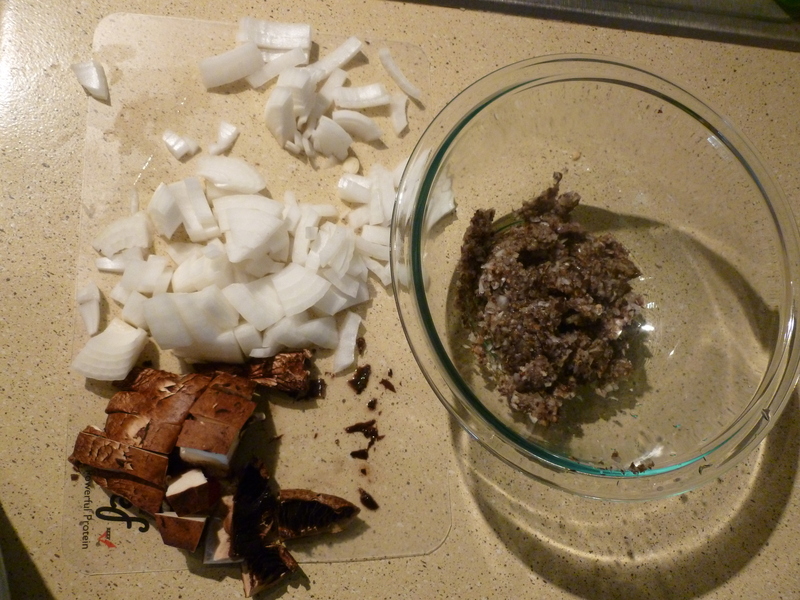 Then it was time to “grind to a paste.” At this point I knew that what Pedatha means is actually physically grind with a pestle and mortar, but I was forced to resort to my food processor. This usually isn’t an issue, ever. But for some reason this stuff just would not turn into a paste. I’m sure if I had a pestle and mortar I could have ground up those mustard seeds to dust, but my little food processor just couldn’t take it. The recipe says its better if it sits in the fridge for a day, so I let it sit for 2 days before trying it because I was so afraid. We finally tried it, and it was just a little…. strange. I know it was me, not the recipe. I think it was a combo of maybe burning the mustard seeds and the whole thing being really way too spicy. It was really disappointing after spending so much time on it. I haven’t given up on Pedatha, though! I know I just need more practice. It was definitely disappointing, but I’m glad for the learning experience. Next time will be better! 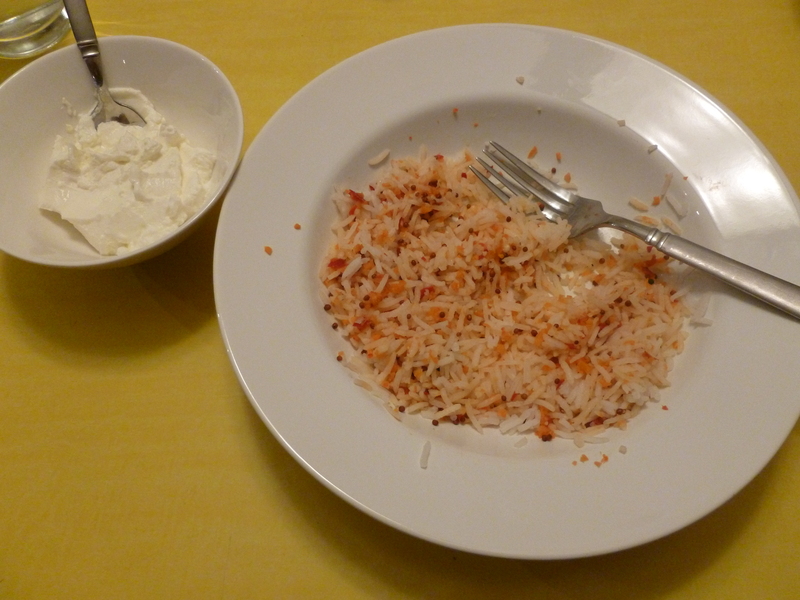 Here is the finished product, mixed into some basmati rice. We ate it with some Greek yogurt to help with the heat…. 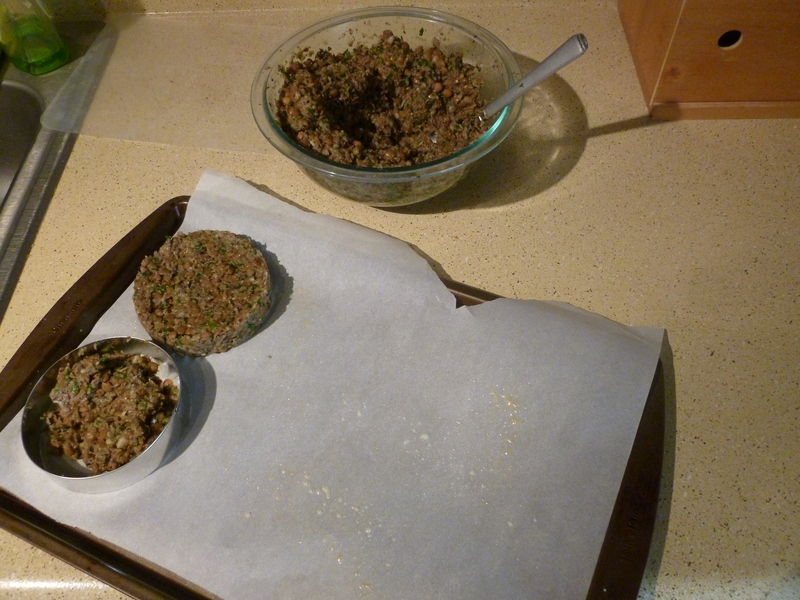 I include the recipe as it is printed in the book, since I can add no further explanations on this one…. 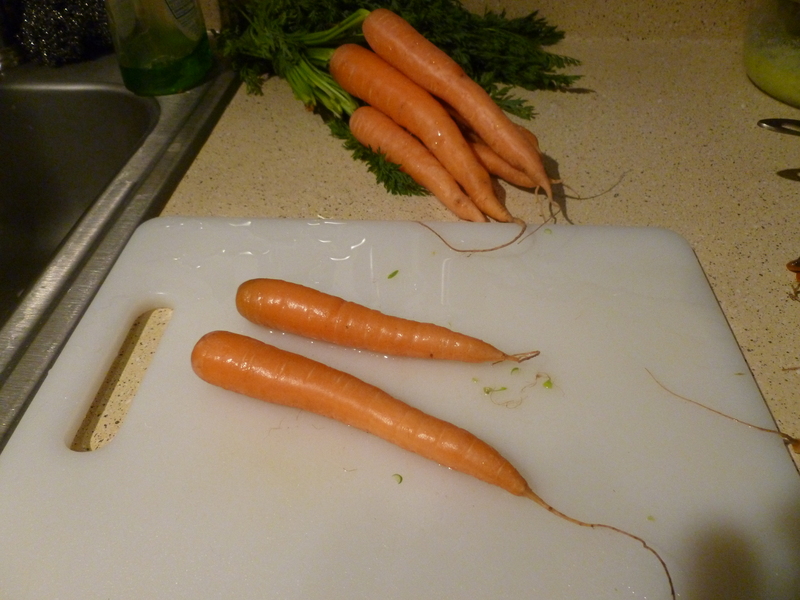 Dice the carrots into 1/4 cm bits. 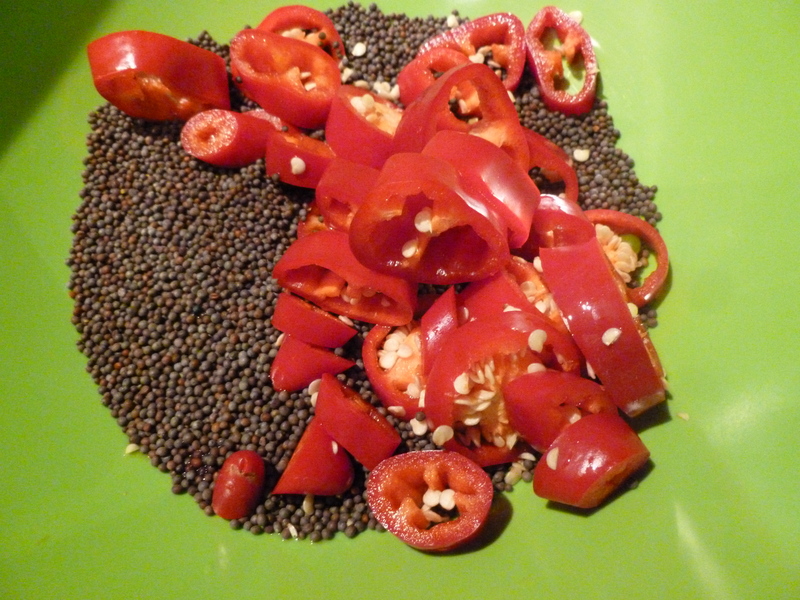 Soak the chiles and 0.5c mustard seeds in 1 cup water for 3-4 hrs (1hr in hot water). Strain and grind into a fine paste, using as little of strained water as necessary. 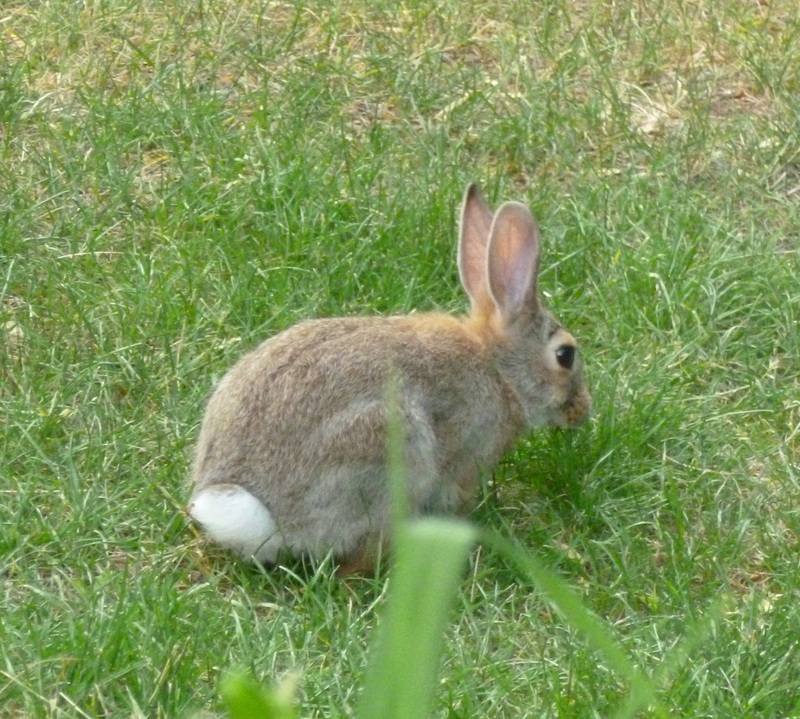 In a skillet or wok, heat oil for tempering. Pop the mustard and then add the fenugreek. 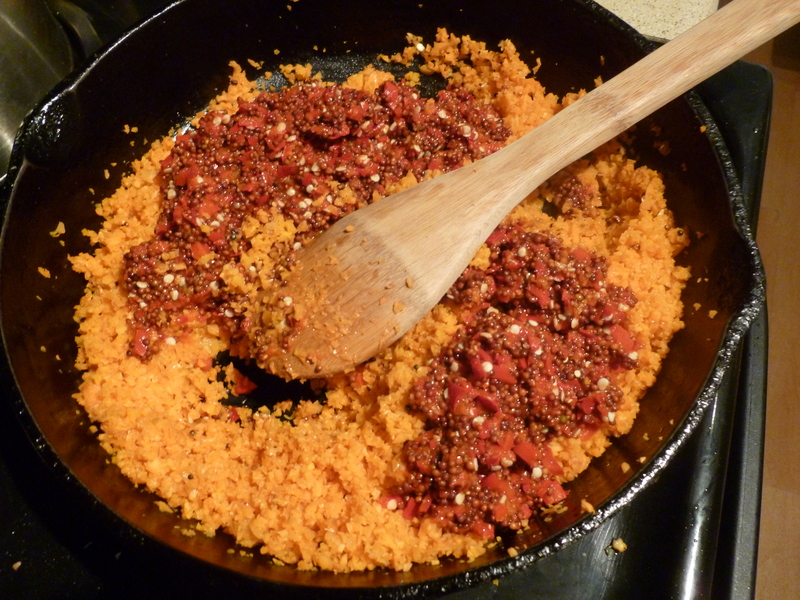 Switch off the flame and with the browning of the fenugreek, add the asafoetida. Add the carrots, lemon juice, chile paste, and salt. 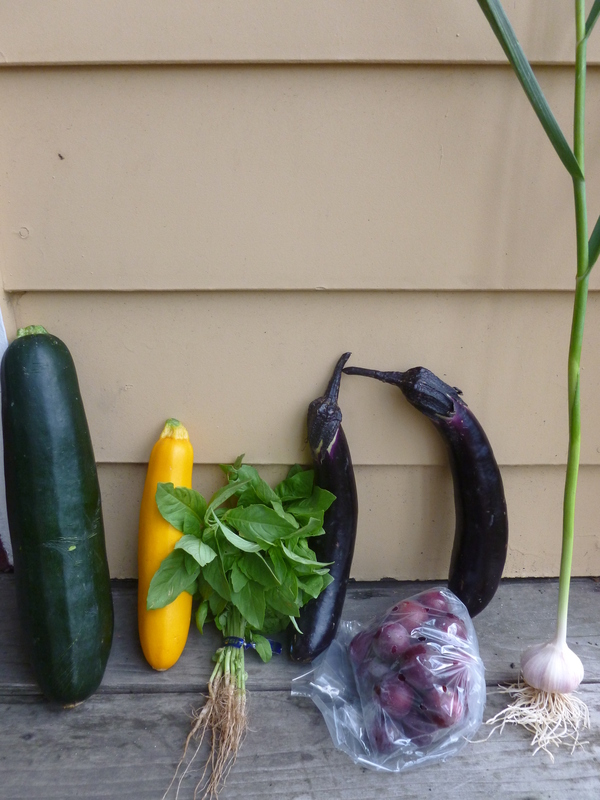 Really looking forward to starting to get that Summer Squash in our share! And more garlic, too! YUM! So a funny thing happened with this week…. 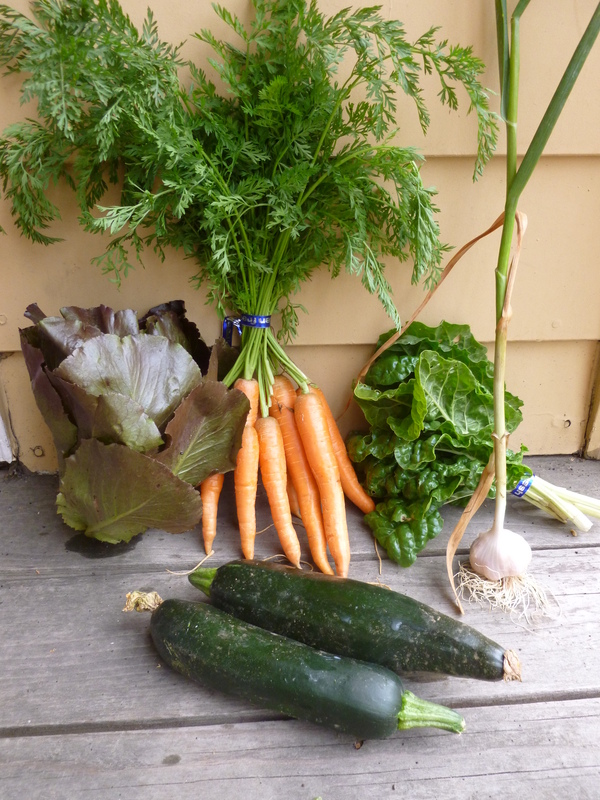 We didn’t end up doing any big dishes with this week’s produce. 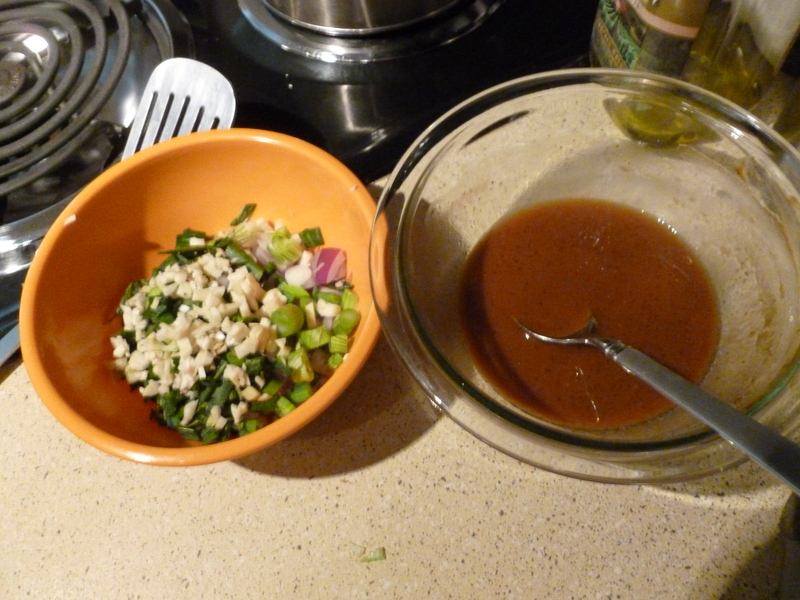 Everything pretty much went into recipes I posted about in weeks past, or recipes that I made in weeks following. It felt like some kind of bridge week, where everything went to help out the produce from other weeks. So here is a recap of what we did with the food (we still haven’t had to throw anything out yet! yay!). I will do my best to come back and update any links here for the “future” recipes. Here is our haul for Week 4. 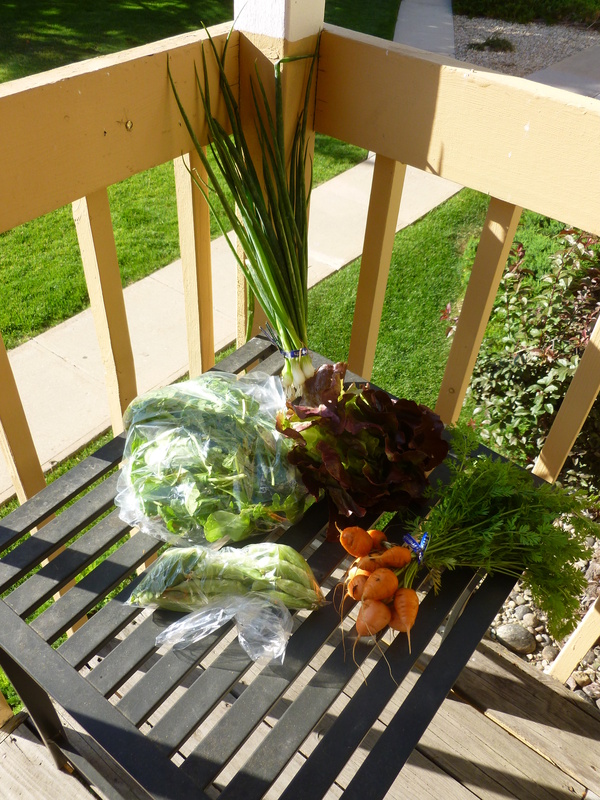 The “new to us” items are the Arugula (fancy!) and the Scallions. 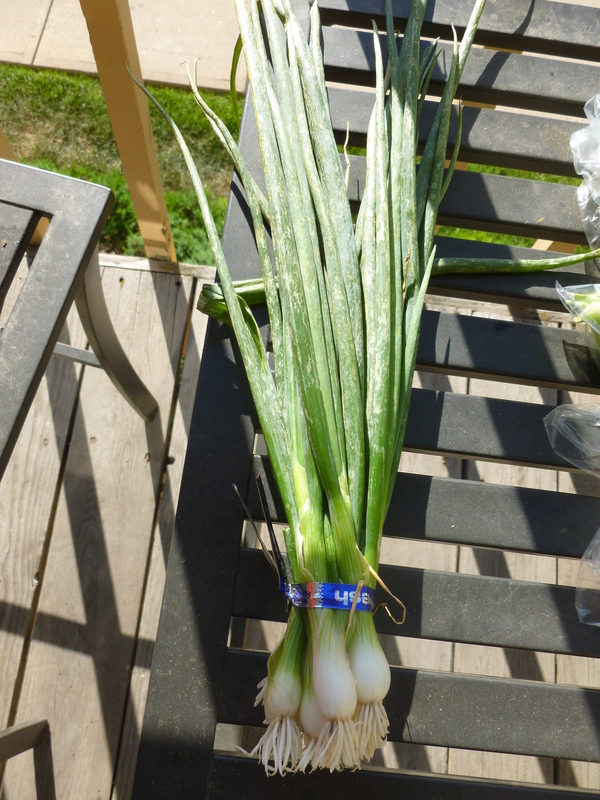 These are some big scallions, holy cow! At the end of this week we got to go camping up in Allenspark, about an hour west from Longmont. 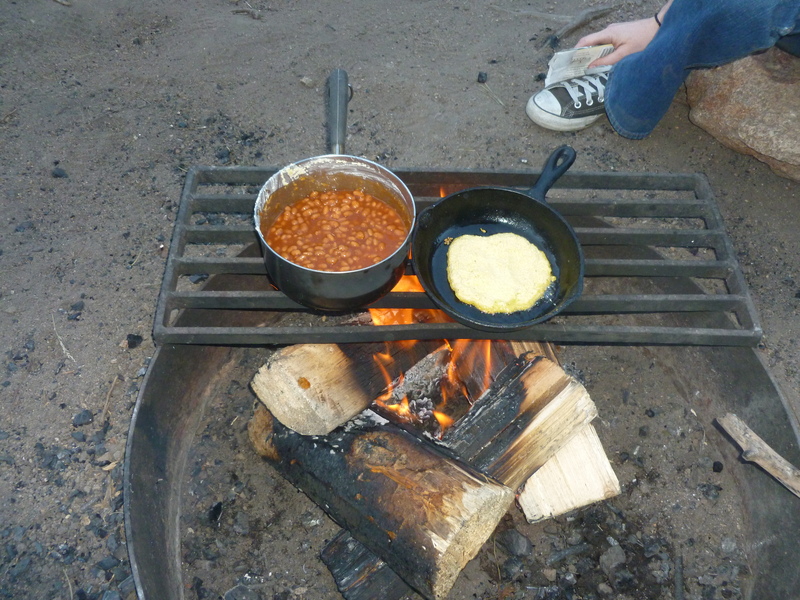 It was a great time, and since it was just days before the state-wide fire-ban went into effect, we were even able to get some (very unhealthy) campfire cooking in!